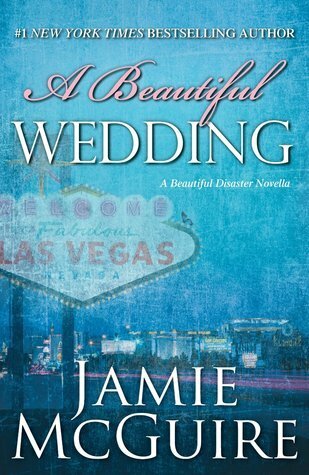 A Beautiful Wedding is a novella that gives a full account of Travis and Abby’s wedding in Beautiful Disaster. Following the horrific fire at the fight where Abby and Travis almost lost their lives, the two hop on a plane to Vegas to get married. The novella gives the reader more detail about Abby’s reasoning for the quick marriage, and also shows us a bit more of what happens after. I was very excited to read this because I will never tire of these characters, but I have to say that I had mixed feelings about this novella. I loved being able to read about the actual wedding, but finding out Abby’s real reason behind the wedding ruined it a bit for me. In Beautiful Disaster, the reader is led to believe that Abby wants to get married so quickly and so young because she can’t imagine another day without Travis, yet in this novella we find out that there is actually an ulterior motive involved. I understood Abby’s motive, but at the same time I really felt like she was deceiving Travis a bit and that he deserved to know the truth about why she was pushing for this marriage. I did like that there was more attention paid to the after effects of the fire–in Beautiful Disaster it seemed as though Abby and Travis brushed it off pretty quickly, but in the novella we learn that it definitely affected them more than it seemed. So many people died in the fire and Travis is left feeling extremely guilty and responsible because it was the fight that he was in that drew so many people to that building. Since the novella is told from both characters point of view, we get to see how upset Travis is and how nervous Abby is that he will be held responsible. Overall, A Beautiful Wedding was a good follow up novella that gives the reader more insight into what really happened at Travis and Abby’s wedding. While I loved reading more of this story, part of me didn’t like Abby’s reasoning behind the elopement. A Beautiful Wedding was released on December 10, 2013.